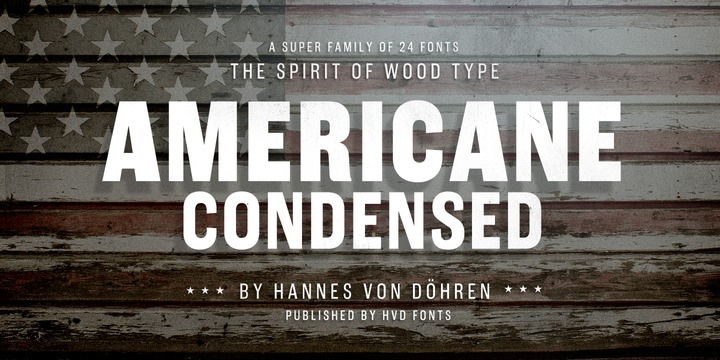 Americane Condensed is a sans serif typeface created by Hannes von Döhren and published by HVD Fonts. Inspired by the old wood type, Americane Condensed together with Americane was designed to be suitable for high professional use, especially for professional typography. This family font is equipped with 12 fonts each, a normal & a condensed width, 6 weights with accompanying italics, a wide range of OpenType features, Central, Eastern & Western European language support … Ready for printed works with a lot of love! A font description published on Friday, April 3rd, 2015 in Fonts, Hannes von Döhren, HVD Fonts by Alexandra that has 4,613 views.